Musanze, Rwanda (CNN) -- The Rwandan government is giving out hundreds of cell phones in an attempt to save pregnant women and babies. Nearly 500 volunteer community health care workers in the rural district of Musanze have been given free phones so they can keep track of all the pregnant women in their villages. The cell phones are used to register and monitor expecting mothers. If there are any questions, complications or updates, health workers simply send a text to their local clinic and receive a response within minutes. A cell phone got 23-year-old Valentine Unwingabire the help she desperately needed. In the middle of the night Unwingabire unexpectedly went into labor and her village health worker, Germaine Uwera, knew exactly what to do. "I sent a text and after sending a text they gave me feedback, and in 10 minutes the ambulance came," Uwera told CNN. It's hard to get ambulances or healthcare in Rwanda's heavily populated rural areas. Roads are unpaved, few people have cars, and nearly 95 percent of Rwandans cannot access electricity. Before Uwera got her cell phone, it took at least an hour to get help. Health workers had to carry patients in a makeshift stretcher for nearly an hour to reach the nearest health facility. 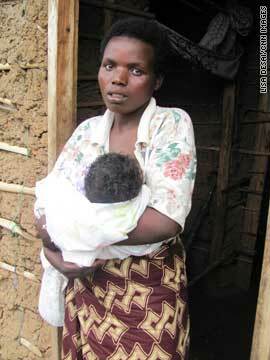 Rwanda is ranked among the world's worst for maternal mortality. The majority of Rwandan women have their babies at home with untrained midwives. Many die from bleeding or infection, both easily preventable with the right care. The cell-phone program, or Rapid SMS scheme, was set up in conjunction with various U.N. organizations to bring the number of maternal deaths down. "We tend to lose people who are actually supposed to be developing this nation," said Dr. John Kalach, the director of the closest hospital in Ruhengeri. "We don't want to be in a nation where we lose pregnant ladies while they are giving life to others." We don't want to be in a nation where we lose pregnant ladies while they are giving life to others. Every text message sent under the new program is stored at nearby health facilities and a central server in Kigali. Health care professionals are able track a woman's progress from her first trimester to the last. Volunteers are also automatically reminded to send in monthly check-ups, and if a doctor spots any problems, they can send a text urging the mother to get to a clinic. In the Musanze district, the program has been a big success. There have been no reported maternal deaths since the programs launch last year, compared to 10 deaths in 2008. According to the UN, the next step will be to give out over 17,000 phones to health workers (specifically in charge of monitoring maternal health) and then to eventually distribute 50, 000 phones to every volunteer health worker in the country. The government hopes to even expand the scheme to other sectors like agriculture and education. But the system does have some challenges. Health workers must travel long distances to charge their phones, and networks aren't always reliable in Rwanda's rural districts. But when the phones are functioning, they do save lives. Thanks to Uwera's cell phone Valentine Unwingabire gave birth to a healthy baby boy, Manirakoze, which means "Thank you God." "When I went to the hospital I was thinking maybe my baby would not be very healthy or maybe premature," Unwingabire said. "But when I found that the baby was OK and healthy, I stopped and I thanked God because I wasn't expecting such a miracle."